CHARLOTTE, N.C. (AP) — President Donald Trump says the prospect of North Carolina drawing new congressional districts just weeks before the November midterm elections is "unfair." A panel of federal judges this week struck down the state's congressional map, saying Republican state legislators went too far in using political data to preserve GOP-held seats. The judges raised the possibility of drawing new districts by mid-September so they can be used in the Nov. 6 elections, or at least before the new Congress is seated in January. Republicans are objecting to the plan, which comes as the party — and Trump — fight to defend the GOP House majority. Trump addressed the redistricting issue during a fundraising appearance Friday in Charlotte for a pair of GOP congressional candidates. "I think it's unfair with this whole redistricting thing they're doing in North Carolina. How unfair is that?" he said. "It's very unfair. You have an election in a little more than 60 days and they change the district on you? And you've already won primaries. How does that work? The court system, OK. How does that work?" Trump said. "You've all gone through primaries or most of you have. It's been districted for many years and now you have to redraw lines to have a new district even though you won a primary in another district?" Trump added: "I don't know. There has to be something going on there." Before arriving at the country club fundraiser for GOP House candidates Rep. Ted Budd and Mark Harris, Trump held a separate event where he signed an executive order directing the Labor and Treasury departments to help small businesses band together to offer retirement plans to their workers. 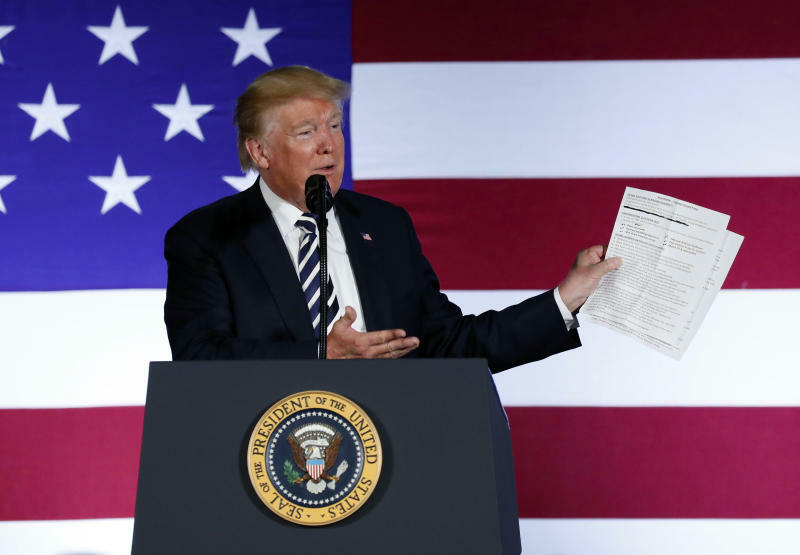 Trump asked the departments to take steps to eliminate regulatory hurdles that he said keep small businesses from sharing costs so they can offer what are called association retirement plans. He said administrative costs and other barriers discourage small businesses from making retirement plans available to their employees. "They'll be banding together. They'll have such strength," Trump said. "They'll be able to negotiate incredible deals." Most Americans use plans offered by their employers to save for retirement. But about one-third of all private-sector workers, and just under a quarter of all full-time workers in the private sector, lack access to workplace retirement plans, James Sherk, assistant to the president for domestic policy, said Thursday. About half of workers at these businesses don't have access retirement plans, Sherk said. He referenced surveys in which more than one-third of small- and medium-sized business that don't offer retirement plans cited high costs as the main reason. The fundraiser also benefited the state Republican Party and the National Republican Congressional Committee. The NRCC said the event was expected to draw 300 people and raise $750,000.